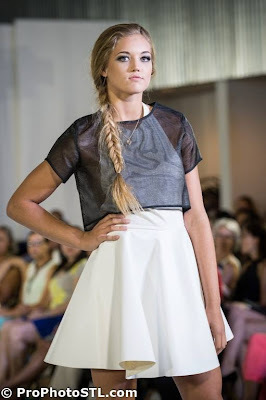 For the first Gateway Gem feature, I'm giving you the scoop on the inaugural Missouri Fashion Week! (Not to be confused with St. Louis Fashion Week, which I will be attending next month. 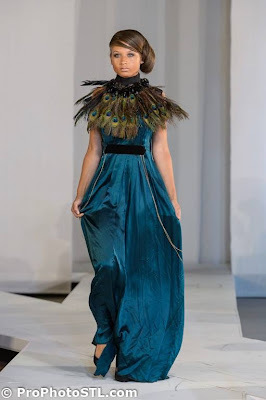 Yes, St. Louis is sparkling with so much style that we now have another major fashion week!) The 4-day extravaganza featured hip hop performances, 20 talented designers, and several local vendors. MOFW was held at The Moto Museum, an ultra-cool space surrounded by motorcycles and biker-inspired outfit creations. For my first official "VIP experience," I was treated to a swag bag of coupons, chocolate, and cute flip-flops. The first evening of was a tribute to St. Louis' long-running Pronto Fashion Show. The show started with an explosive dance performance by "choreographer to the stars" Wizdom Truth. Next, looks from 7 designers graced the runway. 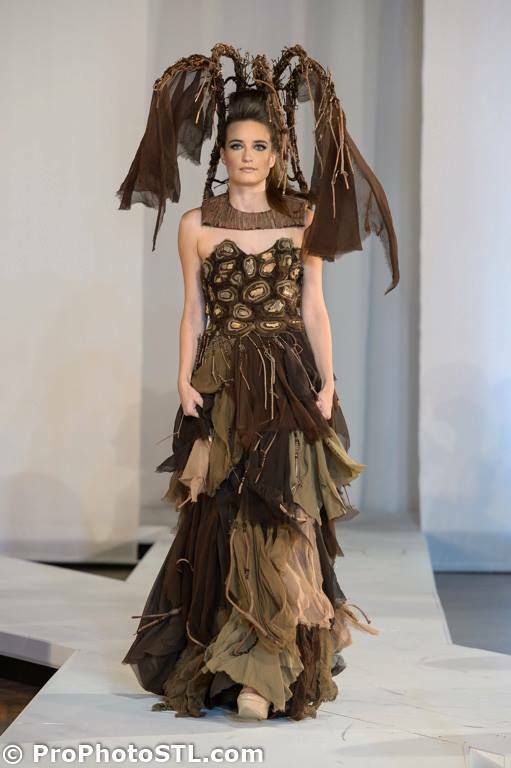 My personal fave was RFD by Rachel Frank's line showcasing feathers, leather and animal-themed headdresses. Wearable? No. Innovative and showstopping? Absolutely! For my outfit, I selected a spicy satin minidress from Women's Closet Exchange. Not only did I score it for a ridiculous price ($29.99, marked down from $220), I love how it tastefully covers my baby bump and is still short and sassy. I also donned my sparkly stilettos. Cute before comfort! I missed Thursday and Friday nights due to other obligations, but was amped for the MOFW finale. After another energetic Wizdom Truth dance performance, the "Biker Chic" themed-show featured 4 designers. I appreciate the inherent coolness and versatility of anything leather, but am not much of a sporty spice. So, my favorite pieces of the night were more glam. Daniel Jolivette showed an amazing white leather dress. I was also blown away by a black coat from Haus by Sierra Moses that had sparkly puffed sleeves. My overall verdict of the event? A resounding, fashionable success! Saturday's outfit went through a few revisions before I decided to nix my original plan of wearing a sparkly tube top and black pants. Instead, I wore the tube top as a skirt and topped it with a studded white blouse. Gold flats and purse provided finishing touches. Me & my haute husband!